Interview someone and identify an everyday problem that they have, then conduct user research and usability tests design a rough interactive paper prototype that addresses the problem. I spoke to a few parents about the process of finding childcare. I also interviewed a nanny to get a sense of their perspective, as they would also use the app. How do you find childcare? What resources are available for finding care? About how long does it take to find a sitter? Tell me about the sitters you’ve had in the recent past. How is the pricing determined? On average how much does it cost per week to have full-time childcare for your kid(s)? Part-time? The dominating trend from the interviews was that parents in particular prefer to get to really know a caregiver before hiring them, if they do not know them personally already. This widely available online resource for parents and caregivers has its pros and cons. Parents find it useful because it has background checks and parents are free to do their own vetting as well. On the other hand, it's a large platform used for all kinds of care, not just childcare. Parents make an extra effort to get to know the potential caregiver. 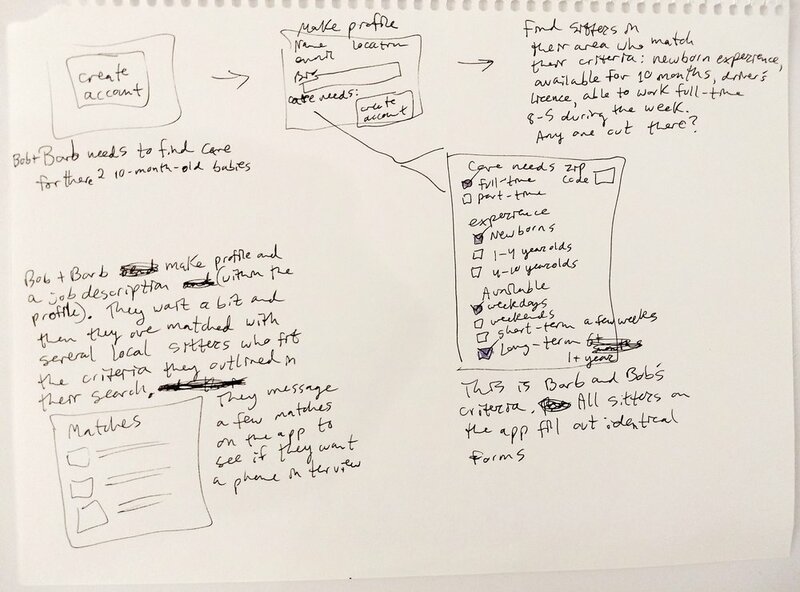 Using information from interviews, I sketched ideas for the app, taking into account parents' thoughts, requirements, and frustrations when searching for care. I created a fictional couple, Barb and Bob, to reflect the needs of the real parents I spoke to. 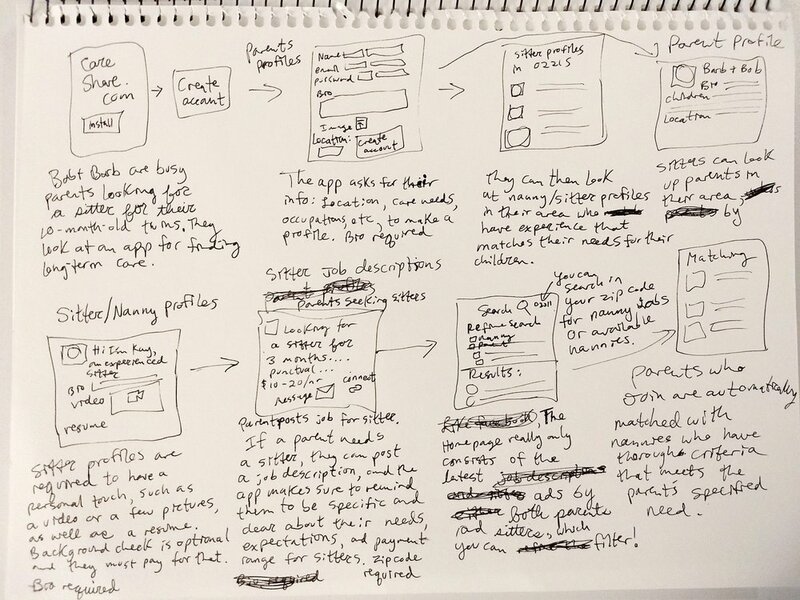 I combined storyboarding and sketching to create a minimum viable design, as efficient and delightful to use as possible. 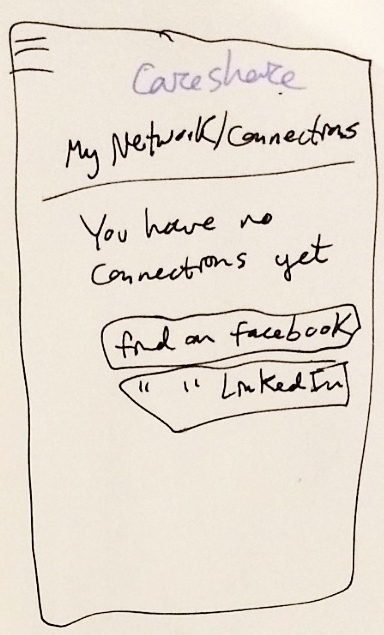 I then pushed that into a paper prototype to start usability testing. Some thought the Blog feature on the homepage was a nice personal touch, though others thought it wouldn't be useful. 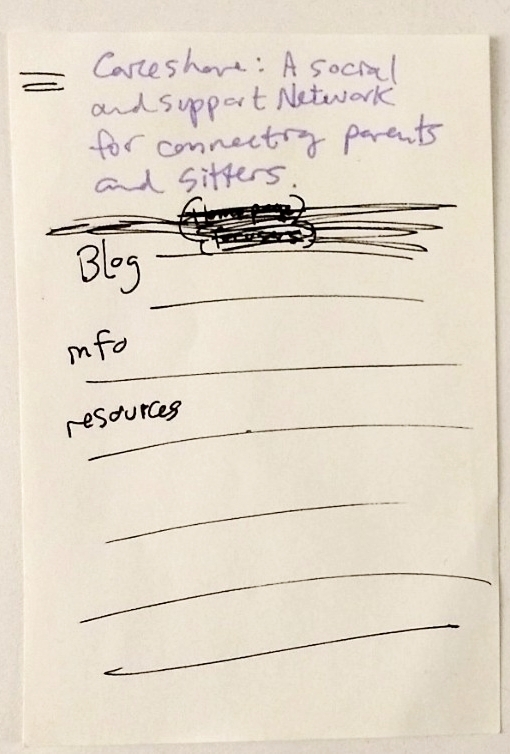 I excluded the blog section from my prototype, as it didn't hold up in usability testing. 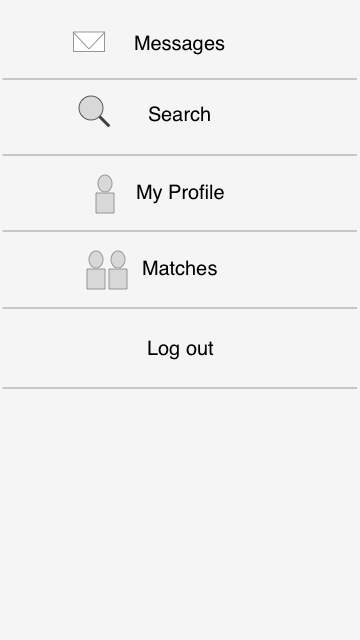 I determined the profile, matches, search, and messages, sections as the most important based on user feedback. The messaging is important in communication and logistics. The profile page has a optional, but strongly encouraged, video section for nannies, maybe parents as well, because it adds a personal touch. The search function wouldn't be necessary if the profile page also had specific fields for availability, experience, age group of kids, and length of commitment in order to match parents and sitters. My design team created a mobile news app prototype for people who want to stay informed and involved with their government.